It's been a bit since I posted but I've been sick for about a week now and pretty much being a slug at home. Stupid summertime cold which I suspect I caught on a train last week. I haven't been sleeping well and I have had a splitting headache for two days. Hoping I can feel better tomorrow so I can take Austin out to do something. He's been very sweet though, bringing me water because I had said my head hurt. He's a thoughtful little guy. I did do something I am pretty excited about during this downtime. I wanted to create a standalone website for my online shop. I'm still on Etsy as I like how easy it is to use and I like the community aspect of it. But I wanted to be able to have a direct site to have customers be able to see my entire product line. Some things I can't really put on Etsy. Some things also don't make sense to continue putting on Etsy (older digital products, for example, as I price those very low and it isn't beneficial to me to continue paying Etsy fees on listing them). I spent a few days researching what option I should go with. Did I want to build a site from scratch such as with WordPress and WooCommerce? Did I want to try Shopify which has all the bells and whistles ready to go for me? Or did I need something simpler. In the end, for now, I have decided on Pattern by Etsy. But boy, was it hard for me to get opinions on this platform. A lot of the articles I read were outdated, as Pattern has updated features and theming since it's launch. It is limited in the theme options, but I do like that everything is done through Etsy's checkout - which to me, means my customers can trust it. Shopify was too expensive, in my opinion, for where I'm at in my business right now. But I am open to switching in the future should I need a more robust site. I've ruled out WordPress and WooCommerce even though it has very high reviews as I am just not ready to spend a ton of time designing a site. As my husband put it best, do I want to spend all my time setting up a website, or creating? So here is what my new site looks like. I like that it is a clean design and organized. It's simple, but has what I need. 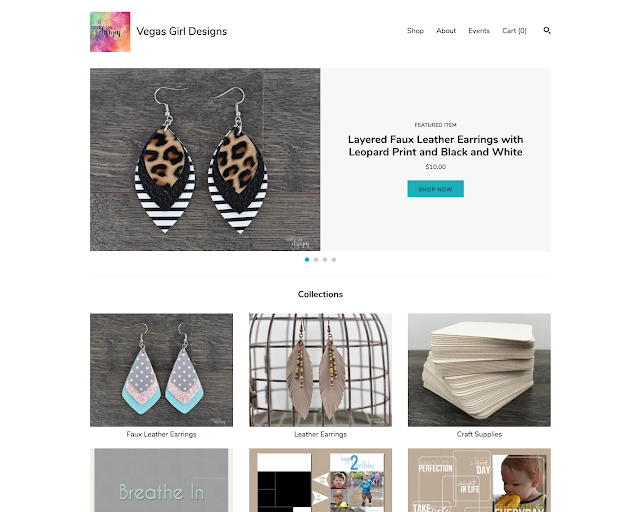 You can check it out at vegasgirldesigns.com if you want to see more than this screenshot below :) (Pretty please go take a look?). Even though I've decided to stick with Pattern by Etsy for now, I'd love for anyone with experience with Shopify or other websites to leave a comment and let me know what they like or don't like. I did check out Indiemade and that one also looks like a really great option. When I'm ready to take on something a little more complex, I want to be prepared before I start! I know I've been neglecting my YouTube channel as well for a bit. With Austin home during the summer, being sick, working on earrings, and having random stuff going on, I just haven't been able to make it work. I definitely don't want to record when my voice sounds so terrible either. But it's not dead, I haven't abandoned it, and I'll be back soon.